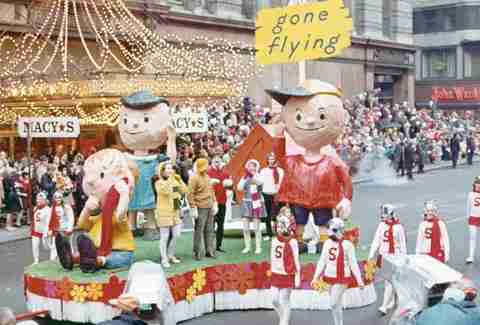 More than a decade older than the Rockefeller Center Christmas Tree (IN YOUR FACE, TREE), the Macy's Thanksgiving Day Parade is arguably the oldest and the most famous holiday tradition in NYC. You might as well know 15 things about it, especially when those 15 things involve giant balloons catching on fire and ramming cops. 1. 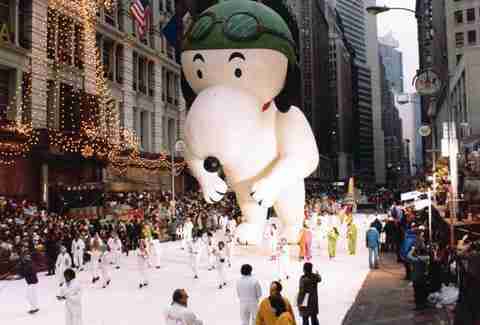 NYC's grand Thanksgiving tradition began in... New Jersey? The immigrant employees of Newark's Bamberger's retail store wanted to celebrate their adopted American heritage with an Old World-style parade. They did such a good job (too good a job?) 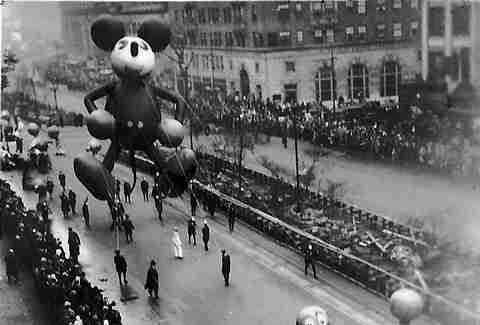 that by 1924 the parade was taken over by Macy's and by 1929 the Bamberger's chain itself was taken over by Macy's, too. Okay, TIED with Detroit for second-oldest. Philadelphia lays claim to the oldest, marking the first (/last) time Philly beat New York in anything. 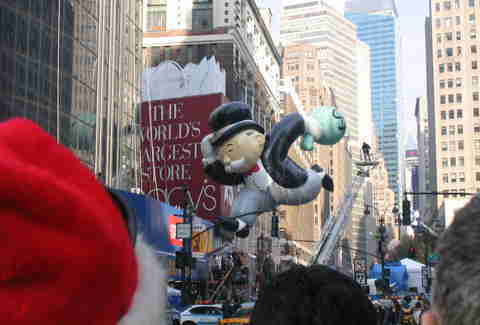 Bonus fact: the Santa Claus float at the end of the Thanksgiving parade was also minted in Philadelphia. 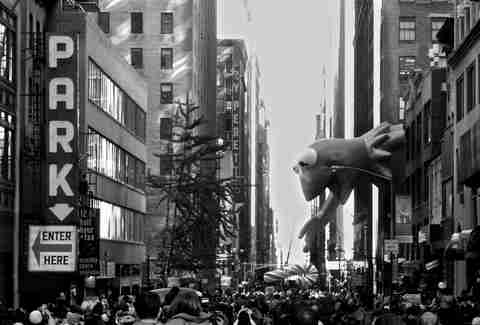 After designing a store window for Macy's, street performing marionette-ist Anthony Sarg teamed up with Goodyear to create the larger-than-life balloons the parade is known for today, starting with Felix the Cat in 1927. 4. Marionettes that occasionally catch fire. And attack cops. Poor Felix. 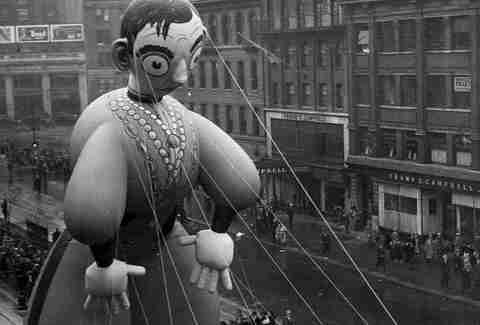 The year he debuted in the Thanksgiving parade, he bumped his head on some telephone lines and caught fire. 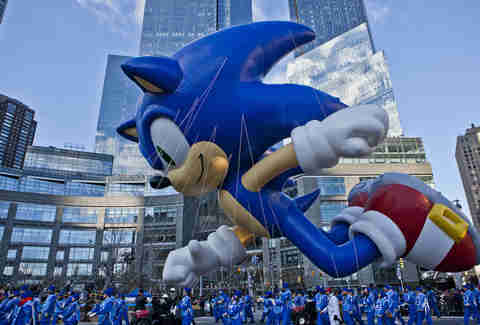 He's not alone, though, in balloon catastrophe: in 1993, Sonic the Hedgehog crashed into and injured an off-duty police officer. 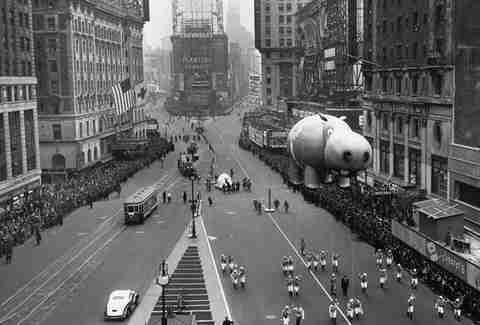 From 1942-44, they shut down the parade because the rubber was needed for military use in tires and the like, and the helium was necessary for the fleet of (floating???) airships used against Japanese submarines in the Pacific Theater. ... second only to the US government. In 1958, a helium shortage forced Macy's to float its iconic balloons down the street on construction cranes. The Marx Brothers -- Groucho, Harpo, and Chico (sorry, Zeppo and Gummo) -- and Eddie Cantor, the performer and songwriter behind "Makin' Whoopee" and the somewhat less sexual "Merrily We Roll Along", the Merrie Melodies theme song. 8. The parade also has "falloons" and "balloonicles"
Falloons are balloons with a float component to them, and balloonicles are land-based balloons that self-inflate and require no balloon handlers (think the Energizer Bunny). 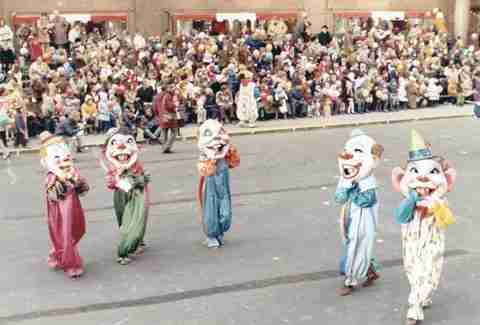 Originally, the festivities began way up on 145th St, before moving to 110th St in the 1930s. These days, the party starts at 77th St, which is a phrase no one's heard in New York City since the 1980s. And each of the handlers has to weigh at least 120lbs. Not so fast, The Entire Midwest: you ALSO have to be in good physical shape to hold those inflated leviathans to the earth. Of the 2,000-3,000 handlers every year, the team leaders -- including a pilot, captain, and drivers -- are required to train in the geometry, aerodynamics, and physics of maneuvering a massive balloon through a major metropolitan city, making it slightly easier than getting a taxi medallion. 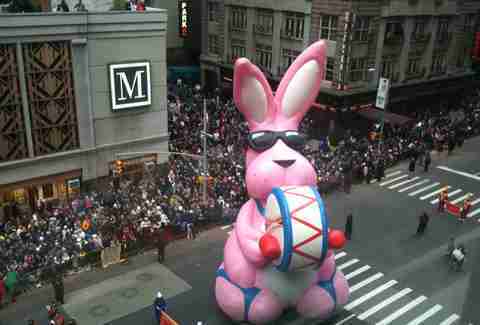 And offered $100 to anyone who found the balloons once they landed and returned them to Macy's. That is, until a pilot crashed while attempting to retrieve one of the balloons. A deliberate mixture of helium and... waitforit... air (!!!) goes into every balloon, with some parts requiring higher concentrations to keep them properly afloat. While they used to be made of less durable rubber, the balloons are now composed of polyurethane. 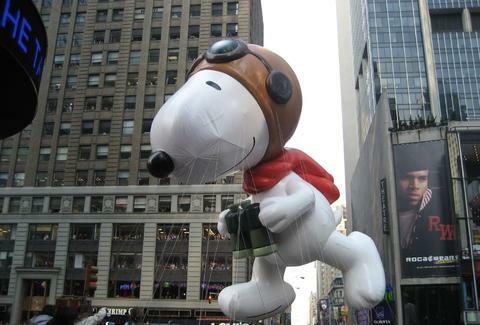 Not that that makes them immortal: Snoopy has made 30+ appearances and is now in his seventh balloon incarnation. 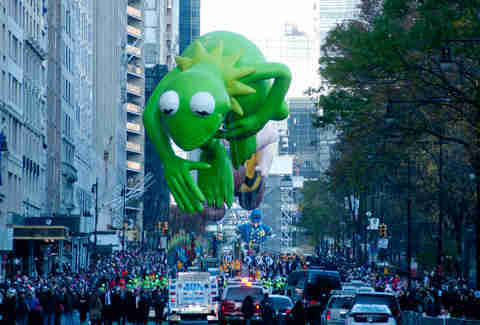 That's the only way to mitigate the soul-crushing reality on the ground, where it's estimated that more than 3.5 million people crowd the streets of the Upper West Side and Midtown, waiting for a glimpse of Kermit's left ear. 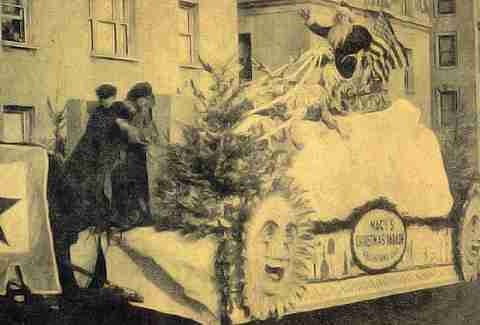 With the exception of 1933, a year noted for its inability to properly understand metaphor in parade arrangements, Santa Claus has always brought up the rear on the Thanksgiving Day Parade, signaling the end of Thanksgiving and the beginning of the mad dash of the holiday shopping season. Patrick Hipp has been writing about New York City for the better part of a decade, but his first book, All The World Is Lost, is about Paris. Follow him on Twitter, Instagram, and Constant Readers.